On the scale on which these things are measured, Mobile World Congress doesn't have a reputation for being a "fun" event. Exciting, vibrant, interesting, and worthwhile - sure. But the number of suits and ties in attendance generally precludes the sort of party atmosphere people expect at events like SXSW or Google I/O. It turns out that if you want to see serious folks in serious suits take a ride down a slide all you need to do is build it: and they will come. By 9:30 on Monday morning the pristine environment of the Android stand - tucked away in a corner of Hall 8 - was a heaving mass of developers, CEOs, reporters, and collectable pin enthusiasts. 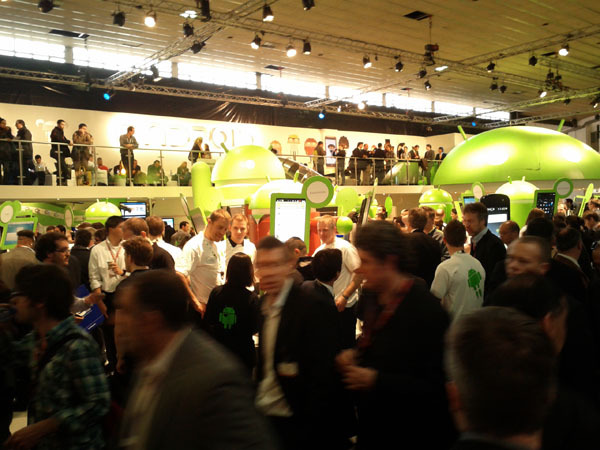 The Android stand (here's some more pictures) at MWC was all about openness and inclusion. The highlight for me was the 40 or so 3rd party developers who (rightly) stole the show. They worked tirelessly, demonstrating their apps and showcasing just what's possible on the Android platform. Developers take note: this could be you next year. Typically at MWC Tuesday is the busiest day, with Wednesday tapering off and Thursday seeing the halls empty and abandoned by midday. Not this year. The stand was packed every day from 9:00 when they opened the gates to 7 when they flashed the lights. Even on Thursday when most stands are rolling up the carpet after lunch, we had a full house until the lights went off at 4pm. Android Gurus, 3rd party developers, and a device bar with over 80 different Android powered handsets kept the crowd entertained. The obligatory slide was in constant use, and free smoothies (the Honeycomb - flavored with honey and lychee - was my pick) were on offer served by a bevy of friendly antipodean bartenders, who towards the end of the event served as the kingpins of a roaring trade in collectable Android pins. Have you got any pins? So it turns out that all you need to transform a clean-cut three-piece-suited CEO into a screaming fanboi is the introduction of limited edition Android collectable pins. What started as a curiosity on day one exploded into full-blown pin-mania by Tuesday. There were 86 of these on offer at MWC - here's a few of my favorites. And we weren't disappointed. There were some great new handsets on display this year, including LG's fascinating Optimus 3D features a 3D display that doesn't require special glasses. The Samsung stand was a gold mine of awesome sauce with the frankly stunning Galaxy S II and the Honeycomb-sporting Galaxy Tab 10.1 tablet. As usual the screens on these devices where gorgeous - and the 10.1" Galaxy Tab was surprisingly light - I'd like to spend a little more time with both. Tablets were the big news of the show, with the Samsung Tab 10.1 and the LG G-Slate joining the Motorola Xoom as forthcoming tablet devices running Android Honeycomb. HTC's also announced their first Android tablet (the HTC Flyer), a 7" tablet that will apparently run Gingerbread before receiving an OTA update to bring it up to Honeycomb. I'm a fan of HTC's industrial design, so I'm excited to see what they come up with in the tablet market. Any trip to Barcelona means great food and plentiful drink and this visit was no exception. While in Barcelona I had the great pleasure of hanging out with the folks who make up the Barcelona GTUG. These guys are as awesome as they are welcoming. MWC is famous for its extravagant parties but hanging out with these guys in a crowded local bar was a definite highlight. Between the fun of the Android stand, the excitement of getting to play with new toys, and the gluttonous pleasure of Spanish cuisine it was an incredible experience. The only question now is how do we top it next year? I'm Loïc from Magma Mobile. It was a great pleasure meeting you and having a little chat at the Android stand. See you next year (or sooner, I hope ! ).